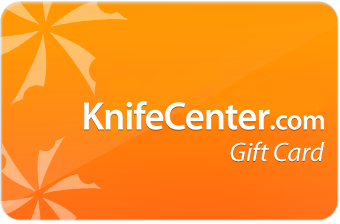 Buy Sharpeners & Sharpening Supplies at Knife Center: The Sharpening Center has accumulated this extensive group of products to maintain any edge. With these tools, you can sharpen kitchen cutlery, pocket knives, garden tools and more. 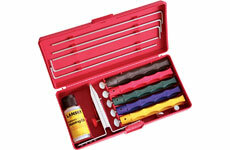 This is your one-stop shop for sharpening related products. 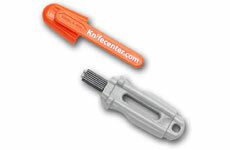 Included are links to sharpening tips and instructions. 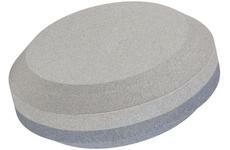 Benchstones are the most common way of sharpening a knife. 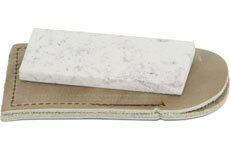 Here at Knife Center, we carry a great variety of benchstones, including the natural Arkansas Stones. 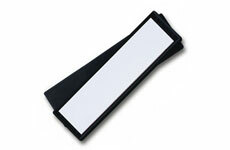 We also carry bases to hold your benchstones. 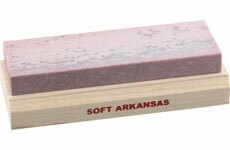 While natural benchstones have a certain attraction, artificial ceramic benchstones are both cheaper & more consistent. Because they are manufactured, their color and grit level are easier to control. Diamonds are famous for being the hardest naturally occurring material on earth. These diamond benchstones, from Diamond Machining Technology and EZE Lap, allow you to use that hardness to sharpen your knives. 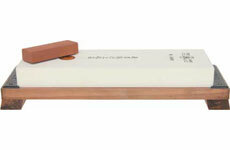 The best edge is achieved by progressively increasing the grit of the stone, moving from course through fine. 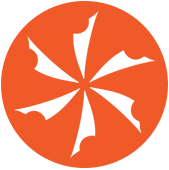 Tri-hone systems put a course, medium, and fine stone on the same device, allowing you to quickly move through all three stages. Just because you are on the go doesn't mean you have to live with a dull knife. These pocket sharpeners come in the same variety of materials as the larger benchstones, but are sized to fit in your pocket. Natural stones only come in so many shapes. Ceramic sharpening tools changed that. These systems use ceramic rods. 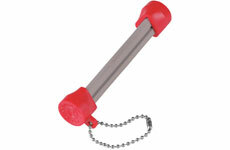 We also carry Mini Ceramic Rod systems, which are small enough to fit in your pocket. 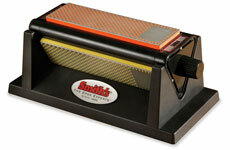 Pull sharpeners take the guesswork out of sharpening knives. No trying to hold the knife at specific angles -- just pull it through the sharpener. 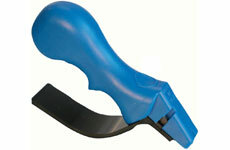 Our large selection of Pull Sharpeners include the stylish Messermeister Chantry Sharpeners. Dog-bone style sharpeners have multiple edges, usually of different angles, making them great for sharpening the serrations on serrated knives. These are also small enough to fit on your key chain. These pocket-sized knife sharpeners are great for putting an edge on your blade fast. 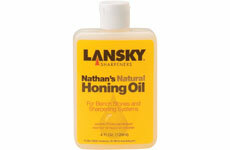 They do not require oil, making them good for travel as well. These are totally hand held without guides. 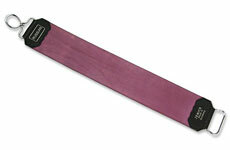 These sharpening files are great for garden tools, machetes and axes. Some are for honing your knife, or finishing its edge. 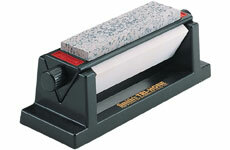 Our diamond based knife sharpeners include benchstones & Retractable Pen Style Sharpeners. 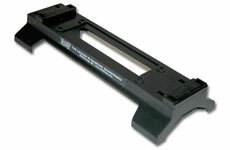 We carry Diamond Sharpeners from Diamond Machining Technology (DMT), EZE-Lap and Hewlette. Formerly known as Charlie's Wheel of Fortune, this kit includes a grinding wheel & a buffing wheel. 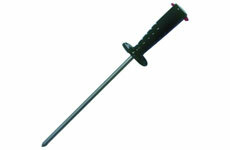 Used properly, it quickly puts an edge on your knife. It is easy to over sharpen your knife on this wheel. 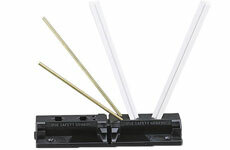 We carry a variety of electric sharpeners, including the Master Grade Professional Knife Sharpener. 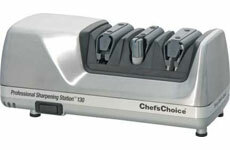 These sharpeners have the stones on a motor, allowing you to quickly sharpen your knives. Sharpening steels are not typically used for sharpening, but rather are used immediately after to hone the knife, smoothing any imperfections from the sharpening. 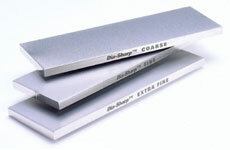 We carry a variety of sharpening steels, including Diamond Coated Steels. 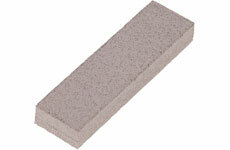 Eraser blocks are used to clean ceramic sharpening stones and rods. These can also be used to clean metal tools, removing rust, tarnish, and other surface blemishes, and leaving a satin finish.